With all the hype about no knead bread and no knead pizza dough I decided it was time to take the plunge and give it a whirl. Last night I started on the journey to make a homemade pizza with some no knead crust and to through a little twist I decided to cook it in a cast iron skillet in the oven. Well it turned out to be incredible and I am glad I made enough dough to make a couple more. There was a slight bit of kneading required in spite of the name but the dough was awesome, but it needs to be planned for and made well in advance. Mix together dry ingredients thoroughly, then mix in water and olive oil until it is mixed evenly, it will be very wet, like sticky and not dough like wet. Drizzle olive oil over the surface of the dough, cover bowl with plastic wrap and let set for 12-24 hours. Once dough has raised. Turn oven on the highest temperature possible (500°F in my case) and put cast iron skillet in the oven until it is heated well. Punch down dough flip out onto a floured surface and divide into small balls and make individual rounds of dough, for pizza. I made three. Roll or stretch out the dough into thin crusts. Have your toppings, sauce and cheese ready. Lightly oil the skillet and then place the crust in the skillet. 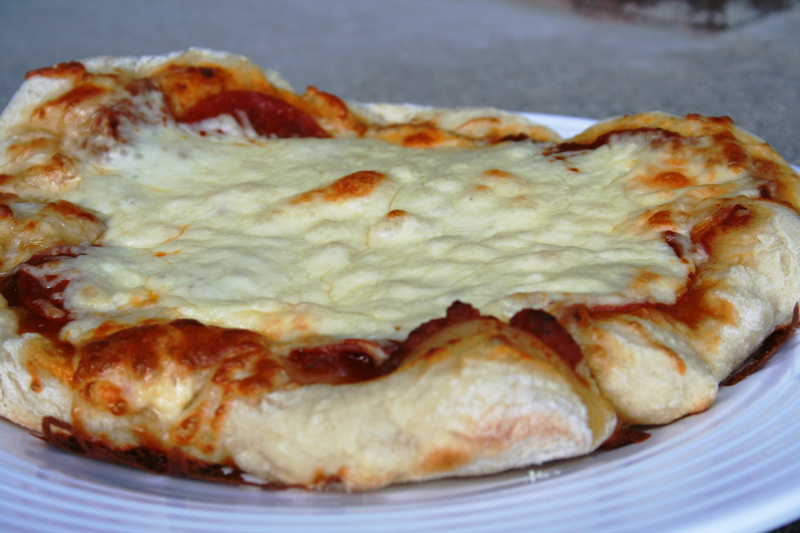 Quickly put sauce, toppings and cheese on the crust. Bake in skillet in oven until pizza is done. Mine took about 5 minutes. Even though you have a little more planning to do than with normal this crust is well worth the effort and advanced preparation. I am glad I have two crusts left, I can’t wait to make it again. This time it was just pepperoni, next time it will be much more elaborate.